The 63 Ranch history dates from 1863 (hence its name). Our family has owned and operated The 63 continuously since 1929. 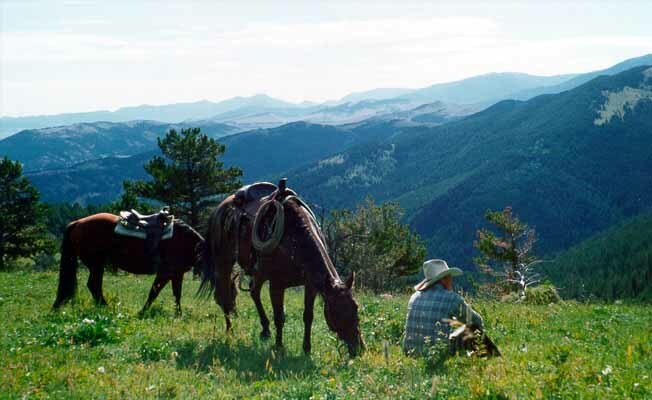 The ranch sits at 5,600-foot altitude, 50 miles north of Yellowstone Park, 12 miles from Livingston, Montana. Tucked among aspen and pines, rustic log and frame cabins with modern bathrooms (tub and shower), welcome singles, couples or families with comfort, peace and privacy. Riding is our main activity. Fly fishermen brush up their skills on our practice pond that we stock for children. Children 6 years and over are included in all activities and riding. Horseback riding for ages 6 years to seniors, who all enjoy our varied riding and gaits. Owners ride with guests daily. Licensed Montana outfitter operating on Gallatin National forest under a special use permit. Talks on history, geology, and wildflower identification. Evening activities include marshmallow roasts, nature walks, square dancing to records, sing-alongs, live music and cookouts. Beginning or advanced riders enjoy lessons in our arena before heading out on rides of their choice. We take pride in serving wholesome family style meals. Our meals include fresh meat, poultry, fish, fruits and vegetables. Deserts and breads are homemade. Daily maid service. Babysitters available by prior arrangement. The 63 Ranch is 12 miles from I-90 and US Highway 89. 50 miles from Bozeman airport where pick-up can be arranged, Delta, Northwest, United, Horizon, Skywest and Big Sky Airlines fly into Bozeman. Trips to Yellowstone National Park and other scenic sites can be arranged. The Livingston Rodeo is every year, July 2 - 4.